If employers were hoping for a mass repeal of employment law following the Brexit vote then they may be disappointed. According to a report by Stephen Taylor, Senior Lecturer in HRM at the University of Exeter and the CIPD’s Chief Examiner, the 19,000 regulations with an EU origin estimated to be on our statute books, are all likely to remain in force. In practice, the terms of a future settlement with Europe are likely to restrict what is possible, at least as far as employers trading in the EU are concerned. Additionally, there are grounds for arguing that in some areas, far from being diminished, employment rights are just as likely to be enhanced following Brexit. Taylor believes it is plausible to foresee a situation in which future UK governments find themselves obliged to strengthen UK workers’ rights thanks to new EU directives which they have been neither able to block nor help shape from the inside. Paradoxically, he says, Brexit might ultimately lead to more rather than less EU-inspired statutory employment protection for UK workers, which won’t be good for business. Taking a sickie can be a fraudulent act according to the Employment Appeal Tribunal (EAT) which is increasingly finding in favour of bosses who dismiss without notice employees who dishonestly claim sick pay when they could be working. If employers have evidence of someone exaggerating the extent of their illness then they are within the band of ‘reasonable responses’ to dismiss without notice. Taking a sickie now has case law to support employers treating the matter with the utmost seriousness. Is the law changing around the definition of a disability? The definition of disability came into force in 1996 and connects being disabled with an inability to carry out ‘normal day to day activities’ which, according to our domestic courts, does not included work. Or should it? The European Court of Justice has been given advice by the Advocate General which extends the definition of disability to include that which ‘may hinder the full and effective participation of the person concerned in professional life’. This is very different from a test based on ‘normal day to day activities’, the implication being that if you do a job that is physically demanding but you are prevented from doing it because of an incident or injury, then that, in itself, may contribute to you being classed as disabled even if you can complete those tasks which most people do on a regular or fairly frequent basis. Potentially, then anyone who is in a physically demanding job and is unable to do it because of injury now has some protection against dismissal where historically if they could live their life in a normal way, they would not be protected. This state of affairs is currently only advisory but EAT recently took the new definition on board in one of its decisions so it will be interesting to see how the case law develops in this area. It’s a well-publicised fact that many women are consistently earning less for doing the same job as their male counterparts but could this unfairness be about to change? From April, the Government will demand that companies with 250 or more employees must publish details of any gender pay imbalances on their website where they will remain posted for at least three years. The aim is to expose those companies which pay women less than men for doing work of equal value. ACAS and the Government Equalities Office have launched a new guide to help organisations abide by the new gender pay gap regulations but will it encourage all businesses whatever their size to comply? With many women around the country working for small, low paying companies, inequality is likely to continue for some time to come. Who is entitled to what employment rights? Rules for companies that employ workers in the gig economy could change following a recent Court of Appeal decision in a landmark case. Earlier this month, Pimlico Plumbers lost its legal battle over the status of its workers, the latest in a string of rulings to find in favour of the employee. The Pimlico Plumbers case comes hot on the heels of a tribunal ruling in January which agreed that a City Sprint courier should be classed as a worker rather than self-employed. The rulings hold wider implications for gig economy firms like Deliveroo and Uber which are both embroiled in rows over employment status. What do you think about these recent developments in employment law? From the implications of Brexit to the gender pay gap – I would love to hear your views. Please leave a comment below. Another Candidate is on the Road to CIPD Qualification Success	What’s the Future for HR? Melinda, this is a great update and will be really useful for CIPD students studying, and of course for any current HR professionals too. 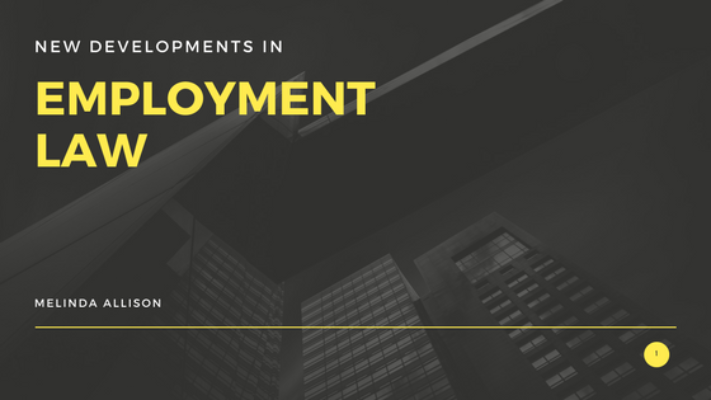 Do you predict any further updates in regards to these areas for the next Employment Law update later this year? Great update, many things for HR to analyse and identify the implications in their organisation. Great article, Melinda – gig economy very topical at the moment. Is this covered in your Employment Law workshops? Yes indeed, we have Level 7 workshops for the CIPD Advanced qualification on 5 April and 8 June and the intermediate level on 19th April all of which cover these and many other key aspects of employment law as it is now and looking at potential changes in the future. Great updates, Melinda. Being small in size, my organisation doesn’t have to participate in gender pay gap reporting but I’m interested to see if the published reports from larger corporations will have a positive knock on effect in closing the gap. Thanks Grace – it would still be good to keep an eye on your own organisation’s median and mean pay analysis by gender as inequality may have a negative effect on engagement. But yes, I agree, to see the results of larger organisations is going to be interesting. Even more fascinated to see what is going to be planned to close the gaps that are revealed! Melinda, a senior adviser at Watson Martin Partnership, specialises in the provision of employment law and HR advice across many business sectors. As a consultant, Melinda also has ongoing support roles, as an HR business partner, for a number of organisations in the not-for-profit sector. Melinda has provided training and is a tutor on a Masters programme for the National School for Government and across the public sector.